A city daily has told its readers to “forget” Hillary Clinton and Donald Trump as it backs a bid to get a high street recognised as the best in Great Britain. The Norwich Evening News is urging readers to support Norwich’s Castle and Arcade district in the third annual Great British High Street competition. 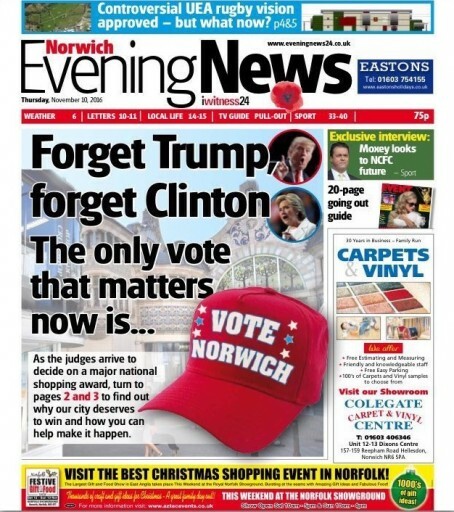 Judges are currently in Norwich assessing the city’s bid, and the Evening News made the front page plea yesterday calling on readers to ‘vote Norwich’. Urging them to forget Wednesday’s election, the newspaper issued a rallying cry that the High Street bid was “the only vote that matters”. In support of the bid, the Evening News also produced 12,000 posters for readers, which can also be downloaded from its website. Evening News editor David Powles said: “We’re delighted Norwich has been shortlisted for such an award and, as is shown with the Norwich Lanes, victory can make such a difference. Bristol and Derby are the other two cities shortlisted for the prize. 12,000 posters is a tad ambitious considering the few people who buy the Norwich morning evening need isnt it? And it’s not part of the annual Shop Local annual commercial sales driver then? Was this ever a newspaper? So why use a red baseball cap – Trump’s trademark headgear? It’s all a bit embarrassing, isn’t it? I doubt any other city dailies are begging for part of their town centre to win some poxy award. And it will look even worse if, after all this, Norwich doesn’t win. Still, an easy way to fill space without employing any actual journalists, I suppose. It’s a bit cringeworthy in as much as they appear to jump aboard any passing bandwagon they feel will get them a few readers and ingratiate themselves with local city businesses. With copy sales dwindling by the week it would be better use of the editors time to attempt to improve the quality of content which might slow down the rapid sales decline a tad. I’m beginning to think Alan Partridge has joined the Norwich Evening News.